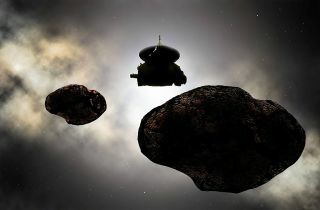 Artist's illustration of NASA’s New Horizons spacecraft flying by the distant object 2014 MU69 on Jan. 1, 2019. Early observations hint at the Kuiper Belt object being either a binary orbiting pair or a contact (stuck-together) pair of nearly like-sized bodies with diameters near 12 and 11 miles (20 and 18 kilometers). You have the chance to hang a nickname on the small, distant object that NASA's New Horizons spacecraft will zoom past on Jan. 1, 2019. That flyby target now goes by the rather uninspiring moniker "(486958) 2014 MU69." But the New Horizons team wants to jazz things up a bit, so they're soliciting nickname suggestions from the general public. You can submit a suggestion through Dec. 1 at http://frontierworlds.seti.org. NASA and New Horizons team members will announce the winner in early January. To be clear: That winner will be a nickname, not the new official appellation of MU69. "After the flyby, once we know a lot more about this intriguing world, we and NASA will work with the International Astronomical Union to assign a formal name to MU69," Showalter added. "Until then, we're excited to bring people into the mission and share in what will be an amazing flyby on New Year's Eve and New Year's Day, 2019!" The upcoming flyby will be the second for the $700 million New Horizons mission, which famously cruised past Pluto on July 14, 2015. Before that close encounter, the best photos of the dwarf planet showed a mere blur of pixels. But New Horizons' stunning imagery revealed a complex, diverse world with a variety of landscapes, from big mountains of water ice to a plain of frozen nitrogen 620 miles (1,000 kilometers) wide. Like pre-flyby Pluto, MU69 — which lies about 1 billion miles (1.6 billion km) beyond the dwarf planet — is cloaked in mystery. For example, astronomers don't even know if it's a single object; MU69 could consist of a pair of bodies, each about 12 miles (19 km) wide, New Horizons team members have said. "New Horizons has always been about pure exploration, shedding light on new worlds like we've never seen before," New Horizons principal investigator Alan Stern, of the Southwest Research Institute in Boulder, Colorado, said in the same statement. "Our close encounter with MU69 adds another chapter to this mission's remarkable story," Stern added. "We're excited for the public to help us pick a nickname for our target that captures the excitement of the flyby and [the] awe and inspiration of exploring this new and record-distant body in space."